These "common sense" measures to curb banking power and protect grassroots people should hit the mark with people who already have negative attitudes towards the banks, which is the majority of New Zealanders. Early feedback from people on the street to the new leaflet has been positive. 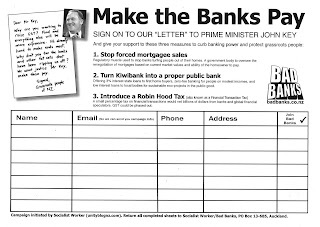 To go with the new leaflet, there's a 'Make the Banks Pay' sign-up sheet where people can give their support to our "letter" to John Key and the three demands. 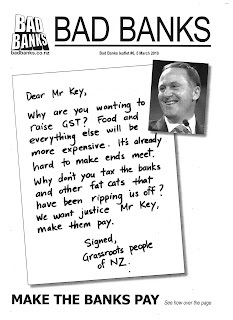 If you would like bulk copies of Bad Banks leaflet #6 and the 'Make the Banks Pay' sign-up sheet, contact Vaughan svpl(at)xtra.co.nz or 021-0415 082. Send all completed sign-up sheets to Socialist Worker/Bad Banks, PO Box 13-685, Auckland. There's an online version of the 'Make the Banks Pay' sign-up. Go to http://www.ipetitions.com/petition/badbanks/ to add your signature. Tell your friends, family and workmates. We want to get as many signatures as possible, to grow the campaign and hopefully get crucial media coverage. There's going to be a lot of media coverage either side of the upcoming budget (20 May) about an almost certain hike in GST, as well as other policies the National government will be implementing in response to the global economic crisis. It's possible that the alternative message of the Bad Banks campaign: "make the banks pay, not grassroots people", could break through into the media. That possibility will be increased if we can build some campaign momentum on the ground and online over the next couple of months. If we work hard we may be able to lift the Bad Banks campaign to the next level. The three "common sense" measures are necessary to curb banking power and protect grassroots people in New Zealand. If we act together we just might be able to deliver a blow to the banks.